Originally mustered into the Confederate Army between June and August 1861, the 21st Georgia consisted of soldiers from the counties surrounding Atlanta westwards towards the Alabama border. Over the course of the war the 21st saw action in over a hundred battles and skirmishes. As part of Robert E. Lee’s Army of Northern Virginia, the regiment participated in most eastern major campaigns and battles including the Valley Campaign, the Seven Days Battle, 2nd Manassas, Antietam, Fredericksburg, Gettysburg, Spotsylvania and Petersburg. Known for their valor and aggressive fighting, the 21st suffered heavy casualties throughout the war. At Appomattox, although the 21st Georgia had mustered over 600 men, only 53 men laid down their muskets and headed home. 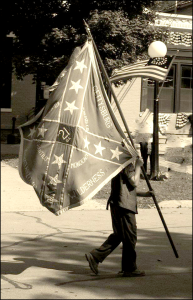 The 21st Georgia reenactment unit endeavors to honor this valiant group of individuals as well as the women and children who supported them. Since we are a family unit all members camp together and share in the unit mess (meals). Most events are weekend affairs, beginning on Friday night and continuing until Sunday afternoon with all participants camping in period correct tents and eating food prepared on the unit fire. Unforgettable memories are created on battlefields, over the surgery table, amid card games, during the parade, under the tent fly and late at night around the campfire. This close-knit living creates deep and everlasting friendships. The 21st Georgia consists of four distinct groups (military, civilian, medical and musician) that all work together to better meet the needs of our members as well as to present a more diverse, educational and informative presentation for the public. The military unit is made up of individuals who portray the soldiers of the Civil War. They participate in drills and battles as well as daily camp life with such activities as mail call or baseball, all while wearing authentic uniforms and carrying weapons and gear from the period. This branch of the 21st portrays the day-to-day life of both the women and children of the 1860s. Wearing correct period attire, the 21st Georgia civilians demonstrate crafts, cooking, sewing, children’s games as well as other 1860s’ events such as the Richmond Bread Riot Our medical unit’s impression of a Civil War field hospital is, without question, one of the best in the hobby. Attempting to correct many misconceptions of 1860s’ medical practices, our doctors, hospital stewards and nurses reenact numerous surgeries and teach about period medicine. The 21st Georgia has its own fife and drum corps that keeps busy at events entertaining the public with period concerts and as they lead the troops into battle or in parades. And reenactment life would seem empty without our musicians to entertain around the fire at night!